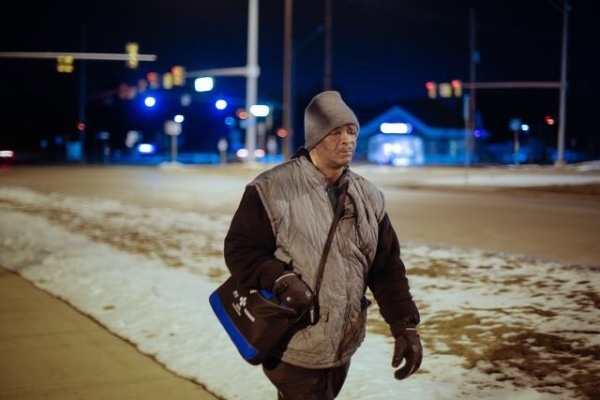 The 56-year-old Detroit man walks 21 miles every weekday as part of his journey to and from the factory where he works. "I never thought anything I did would garner this much attention," Robertson said. Robertson takes the bus some of the way, but for the past decade, ever since his car broke down, he has trudged the better part of a marathon each workday. Rain, snow or shine. After reading about Robertson's commute in a Detroit Free Press article from over the weekend, college student Evan Leedy was moved. Like Robertson, the 19-year-old lives and works in two counties, so he spends a great deal of time commuting himself. But Leedy has a car. 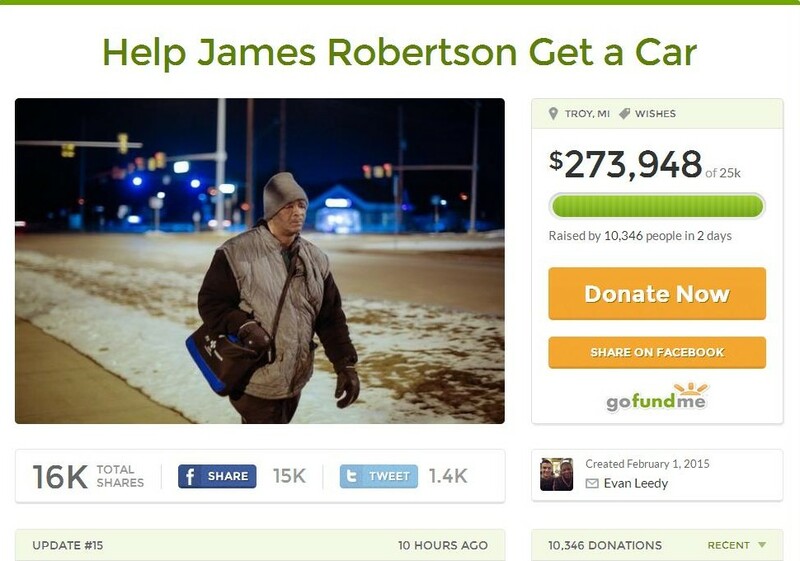 Leedy decided to set up an online fundraiser to buy Robertson a new car. "My first car cost $3,000," Leedy said, "So I set the goal at $5,000. Within an hour, we'd raised $2,000." Leedy's fundraiser on GoFundMe has blown past its original goal, reaching more than $270,000 by Wednesday. Robertson, in a video message posted on the Free Press website, gave thanks. "Everybody calls me the inspiration, but to those who have been great enough to donate and everything ... it was really so welcome that I don't know what to tell you," he said. "You guys are the heroes." Comments on the page from people donating money suggested that the story of Robertson's dedication to getting to work had tapped into a deep well of public feeling. Blake Pollack identifies with the strangers' words of support. He first spotted Robertson during his own work commute a year and a half ago. "Climbing over snow banks, when it was pouring down rain in the summer," Pollack said, "Whatever the weather, he was there." Pollack approached Robertson, who told the financial executive his story. Pollack promised to give him a ride the next time he saw him. "Two to three months later, I saw him on a corner," Pollack remembered, "And I asked if he needed a ride to work." Pollack estimates he's given Robertson between 40 and 50 rides since then, and the two men from vastly different worlds have formed an unlikely friendship. The pleasure, Pollack said, has been all his. "I'm the lucky one," Pollack said. "Driving him around isn't a chore, it's a reward." Pollack said Robertson is inspirational and funny, adding that his work ethic puts anyone to shame. "I set our attendance standard by this man," Todd Wilson, plant manager at the engineering factory, told the newspaper. "I say, if this man can get here, walking all those miles through snow and rain, well I'll tell you, I have people in Pontiac 10 minutes away and they say they can't get here -- bull!" Robertson apparently has a perfect attendance record. He earns $10.55 an hour, not enough to save up to buy, insure and operate a car in the city, according to the newspaper. With the online donations now topping $270,000, Robertson, Pollack and Leedy met together for the first time Monday night. The overwhelming support has extended beyond money -- and several car dealerships have offered to give him a vehicle outright. "Now that [the effort] is so big, there's so much more to think about," Leedy said. There are, unfortunately, people who want to take advantage of Robertson's newfound celebrity and his generosity, Pollack said. He put together a team that includes an attorney from a large law firm in Michigan, a CPA and a certified financial planner that he says will ensure the donation money is handled appropriately and in a way that best serves Robertson. "This money that is being given to him -- he earned every penny of it," Leedy said, just by his work ethic and his attitude. He's been making the arduous 21-mile journey from Detroit to Rochester Hills since his 1988 Honda Accord gave up on him. The donations mean that Robertson's mode of transportation will likely soon be changing, and without the long commute, he'll probably be getting a lot more sleep. But he loves where he works, so he has no plans to change much else. "I can't imagine not working," Robertson said. "It's what I've always done." Robertson, in his message, said he never expected as much support as he has received. He encouraged people to look out for one another. "If this story will touch at least one person and inspire them to do something out of the goodness of their heart, I will be the happiest person alive," he said.